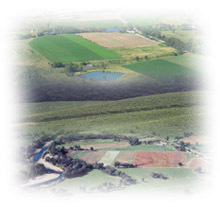 Land use is diverse in the North East region of Victoria. Private land comprises approximately one million hectares (about 46% of the catchment region), most of which is cleared for agriculture. Approximately 43% (12 595 hectares) of the region’s agricultural land consists of pasture (irrigated and dryland). Public land in the North East region covers about 1.2 million hectares (roughly 54% of the region). Uses include National Parks, State Parks, Flora & Fauna Reserves and State Forests. North East Land Use The Land use map is intended to provide a broad overview of agricultural and other land uses throughout the region. Data used to generate this map was derived from the land use layer (LAND USE250) of DPI/DSE's Corporate Geospatial Data Library. This layer contains polygon features delineating broad agricultural land uses.